Time for good mixing of the combustible and the oxidant. Temperature for bringing the combustible mixture to its ignition point. Turbulence to complete the combustion without going below the ignition point. 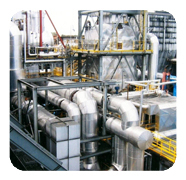 Our Offgas combustion Furnaces are built to incorporate these three requirements. 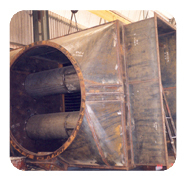 The combustor-a refractory-lined Furnace is kept hot to provide the proper temperature, cyclonic principle is used to provide the turbulence and intimate mixing of the Offgas and combustion air, adequate combustor volume is provided for the necessary residence time to complete the oxidation of the combustible components. The Offgas enters the refractory-lined combustor tangentially through a rectangular port at high velocity. Tangential entry and high velocity imparts a strong swirl to the Offgas and the resulting centrifugal force makes the Offgas hug the hot refractory. Part of the combustion air is forced into the swirling Offgas through multiple radial nozzles in the refractory. This high momentum jets help the less viscous air to mix well with the more viscous Offgas. The tangentially flowing combustible mixture quickly absorbs heat from the refractory by convection. Combustion is initiated in the primary section and goes to completion in the ensuing secondary section. 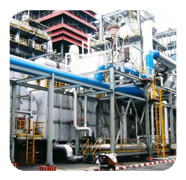 Oil fired burner serves for start-up (warm-up) of the system . During normal operation with Offgas, if the Offgas flow and quality are adequate, there is no need for any flame stabilization by supplementary fuel. 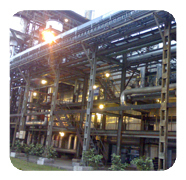 TSPL has successfully executed many Tail Gas Boilers for the Carbon Black Industry in India and Overseas. We can offer Tail gas Fired Boilers upto 150 tph. Our design of Carbon Black Gas Boilers is suitable for turn-down ratio of 25% to 110% of MCR without support fuel, instead of 40% to 100% as in conventional design. Hence, better flexibility and fuel savings. 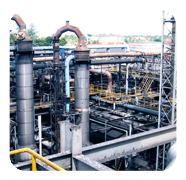 Our design of Carbon Black Gas Boilers is suitable for steam temperature control range of 30% to 110% of MCR, instead of 50% to 100% as in conventional design. Hence, better flexibility. Our design of Carbon Black Gas Boilers don't require support fuel till the BF gas flow comes below 25% of MCR instead of 40% of MCR, or LHV fall below 450 Kcal/Nm³, as in conventional design. Hence, fuel saving. In our design of Carbon Black Gas Boilers, the combustion is controlled by sensing the fuel gas temperature (more reliable) compared to Flame Scanner, when temperature of fuel gases fall below 850°C due to BF gas flow below 25% of MCR, or LHV of gas falls below 450 Kcal/Nm³, support fuel cuts-in automatically, to sustain the combustion/heat release, avoid trip and maintain Steam Generation Rate. This arrangement ensures smooth and steady operation, and avoids a trip.